Timeena, Timmy's female fairy form. Here is a picture of Timeena, Timmy's female fairy form from the Nickelodeon Magazine comic strip Elmerella.. Wallpaper and background images in the The Fairly OddParents club tagged: timmy timeena female fairy girl godmother elmerella nickelodeon magazine. 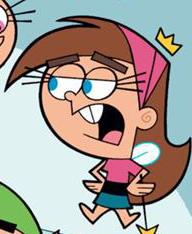 Here is a picture of Timeena, Timmy's female fairy form from the Nickelodeon Magazine comic strip Elmerella.